Google has recently made some exciting new updates to Classroom thanks to all of the feedback and suggestions from teachers. Starting today, Classroom will enable Teaching Teams, Save draft, Autosaved grades, and Better notifications. 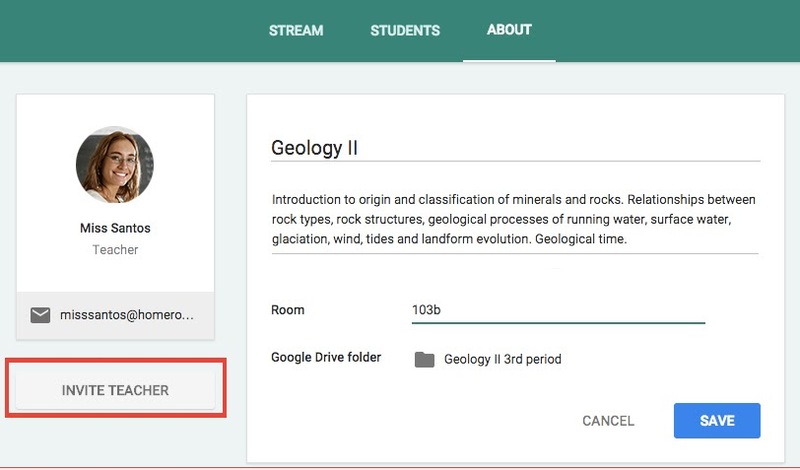 Google built Classroom to help teachers spend less time on paperwork, and more time with their students. Since it launched, Google has also heard from teachers and professors that they’d love to be able to use Classroom to collaborate with other educators. Teach together: Whether it’s a substitute, a teacher’s aide or a department chair, almost every teacher and professor is supported by other educators. So starting today, you can have multiple teachers in a Classroom class. To try it out, just go to your class’s About page and click “Invite teacher.” Additional teachers can do almost everything the primary teacher can do: they can create assignments or announcements, view and grade student submissions, participate in the comments on the class “stream,” invite students and even get email notifications – everything except delete the class. Dani Raskin, a special education teacher at Clarkstown High School South in New York, has been helping Google to test out this new feature. “It’s really important for me to be able to work closely with other teachers who also teach my students, but we don’t always have prep time together,” Dani said. “We are now able to split the workload: both of us can provide direct feedback via comments and grading. It really fosters an authentic sense of teamwork and collaboration." Prep for your classes in advance: Google knows how much planning goes into every class you teach, and now they are making it a little bit easier to do some of that planning in Classroom. You can save announcements and assignments as “drafts” and wait to send them to students until you’re ready. And similar to Gmail, any time you start creating a new announcement or assignment, it’ll be automatically saved as a draft. This works with multiple teachers as well, so all the teachers in a class can collaboratively prep assignments in advance, and even make changes to each other’s posts on the fly. Autosaved grades: If you can’t get all of your assignments graded in one session, but still want to return them to students at the same time, grades will now be auto saved as you enter them. You can choose when to return them to students. Better notifications: Teachers and students will now receive email notifications when a private comment is left on an assignment. For schools here in North America and in Europe, Google knows you’re working hard as you round the corner into the end of the year. Google, is too, and they will have more Classroom news for you before school’s out for summer.